Hundreds of people turned out for a major networking event designed to bring Peterborough businesses together. The second annual Peterborough Biscuit business event attracted more than 1,000 visitors across the day. Held at the East of England Arena and Events Centre, 257 businesses and organisations took the opportunity to showcase their services and products at the Biscuit. Visitors were also treated to an array of fun events - including a colourful mascot race between various organisations including Peterborough United, Princebuild, Anna’s Hope, Metro Bank and Peterborough Greyhounds. 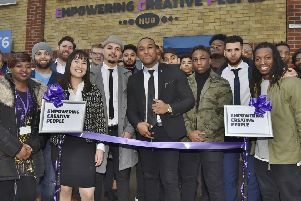 The event was opened by Peterborough City Council chief executive Gillian Beasley and Peterborough entrepreneur and BBC Apprentice winner Joseph Valente. Yaxley film star Warwick Davis also dropped in with Simeon Dyer and Ray Griffiths on the Little People UK stand. Organiser Steve Smith, of Sphere Risk Health Safety Management, in Peterborough, said: “I am delighted with the attendance. It is much higher than last year and we also have more exhibitors - 257 compared with 124 last year.